Imagine you decided to move into sales and on your first day, someone handed you a list of the organization’s top customers and responsibility for the entire CRM system. No training, no support, no roadmap. This is pretty close to what happens in community management today. Most people are suddenly handed responsibility for building a community from an organization’s top customers on an advanced technology platform. Often they have limited training, support, or a detailed roadmap. At best, this leads to communities failing to reach their potential, getting bogged down in common problems, or unable to show their value. At worst, it leads to empty ghost towns or pointless casinos (communities with lots of meaningless engagement). The level of training given to community teams today is abysmal. It’s the root cause of most of the problems you and your team are facing. It’s important to make continual progress of your community team a priority. Your team, your members, and your organizations deserve better the best. In this post, we’re going to highlight how to benchmark yourself and your current team. We’re going to identify the skills they need and how you can set reasonable targets for each of them. We sometimes receive emails asking if one of our courses is right for a participant. This is a hard question to answer without knowing someone’s ability. Most people don’t know how good they are because they have no benchmarks to measure themselves against. They use the size of their community rather than their own abilities. 1) Strategy. This is the ability to develop and execute a community strategy which deploys the organization’s limited resources to maximum impact. 2) Engagement. This is the ability to proactively engage, nurture top members, and build systems to improve the overall participation environment of the community. 3) Content. This is the ability to create original content and drive high-value contributions from other members. 4) Technical. This is the ability to select, implement, and optimize a community platform. This includes resolving technical problems and managing vendor relationships. 5) Business. This is the ability to build allies throughout the organization, measure value, run a community team, and gather more resources for the community. We break each of these down by four distinct levels ranging from ok to world-class. 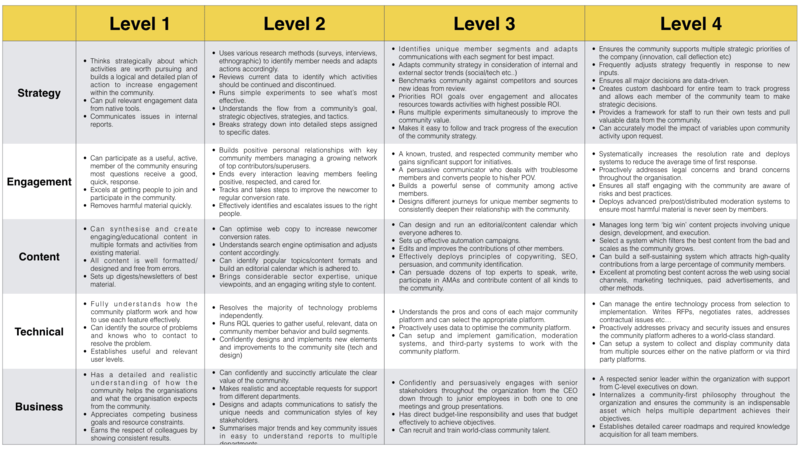 You should strive to gradually upgrade yourself and the community team to a world-class level in each of these areas. This is subjective, but I recommend copying and adapting our benchmarking resource below. Score each member of staff between 0 to 4 on each of the five attributes. When benchmarking someone’s strategic abilities, you want to track their journey from thinking strategically to having a codified and invaluable strategy everyone understands and supports. This increasingly relies on research, metrics, and project management skills. Strategy is about allocating resources to have maximum impact. It’s not about trying to do as many things as possible, but deciding what’s worth doing and allocating maximum resources to ensure success. Or, to use an analogy, it’s not about dividing resources evenly to fight every battle, but about deciding which battles are worth fighting (see this big wins talk). The first level is to ensure all staff members are thinking strategically about how they spend their time. Are they constantly using available data to reviewing which activities they undertake are driving results and pursuing those which are most effective? As your staff progress, you want them to be proactively researching what members want and using that data to improve the community. They should know how their tactics serve a strategy which serves an objective which serves a goal. At the more advanced level, you want them to become great at segmenting members, ensuring members are making their most valuable contributions, establishing benchmarks, and pursuing reasonable community goals. The strategy should be internalized here throughout the entire community team with modeling of different inputs to achieve goals. Engagement skills are the core abilities of the community team to create the perfect environment for every member to make their best possible contribution to the community. This begins at the lower levels with being a terrific community member. Do your community staff resolve and escalate problems well? Can they remove the bad material quickly? Do they build positive relationships with community members? As they move up the chain, they should focus on building systems which build a powerful sense of community and nurture superusers among the group. They should get better at building and optimizing the journey which turns newcomers into regular, active, members. At the highest levels, you and your team need to be able to improve the resolution rates, address legal/brand issues, and ensure all staff know how best to engage members in the community. At the simpler levels, all members of your team should be able to synthesize great content from existing work and member contributions. This should be nicely designed and implemented across multiple platforms. As you improve, you should be able to optimize web copy and improve conversion rates, increase search traffic, and build an editorial calendar. This requires reasonable copywriting and SEO abilities. At the higher levels, your team should be able to ensure an editorial calendar is adhered to (surprisingly hard), develop automation campaigns, edit contributions of other members and persuade top experts to create great content for your community. Finally, a great community professional should be able to commission ‘big win’ content projects (e.g. our platform selection tool) which goes far beyond a simple blog post or video. It brings in a unique, viral, idea to attract great search traffic, and has a unique design/development. Far too many people in this field profess to ‘not being technical’. This isn’t good enough when your entire work depends upon being adept at managing a technology platform and what happens within it. At the basic level, this requires knowing how the features of the platform work and being able to diagnose any potential problems which arise. Your staff should be able to learn this by testing things, experimenting in the community, and asking around in the vendor’s relevant communities. Beyond this, you need your team to be able to resolve most issues independently, run SQL queries to get the data you need and make improvements to the structure and design of the community without help. This kind of knowledge is best gained through peer support. As you reach the more advanced level, you want to know more about the platform environment, using data to improve the speed and functionality of the platform, and using the best features from any third party platforms to build the best community possible. Finally, you want to be able to take responsibility for the entire vendor process and address legal/privacy/security issues which can arise. Business skills are the link between the community and the organization. This is about you being able to make the community indispensable to the organization. This begins with knowing how the community is supposed to help the business and the resources available to develop that community. As you get better, you should become more adept at acquiring more resources by building a strong internal narrative and persuasively winning over any skeptics and key stakeholders within the organization. Finally, this evolves into being able to attract and retain world-class community talent, build career maps, and build a community-first culture among the organization. The very best people I know have a pipeline of people eager to work for them. This doesn’t happen by accident, it happens by doing what one friend calls ‘building pipe’, constantly showing up, making connections, and knowing what talent you’re looking out for. Now you have your benchmarks, you can begin to set reasonable targets of improvement for each member of your team. A reasonable level of progress is an increase in 1 level (of 1 attribute ) every 2 to 3 months at the first two levels and usually 3 to 6 months at the upper levels. This gives your team a clear focus and lets you build a roadmap of what you expect over 6 to 12 months. This, in turn, lets you identify what kind of support you need to provide the community team to help them reach each level. Courses aren’t the only method of improving your community team or improving your own abilities. There are multiple channels available here, each can work in different situations. Professional courses. I’d recommend our Strategic Community Management and Psychology of Community courses for strategy/engagement development. Books. Focus on specific topic areas, not pop. business books. This tends to be good for content skills and some marketing/growth abilities. Conferences. This is good for content/SEO skills, some engagement skills, and some highly focused areas. It’s good for building relationships which can help in other areas too. Blogs. These are fantastic for most areas, especially psychology, marketing, SEO, and analytics. Find the right expertise here. Peer communities. Both industry sites like CMX, Community Roundtable, FeverBee Experts, but also communities in each unique field like technology, journalism, copywriting, marketing, SEO etc…Encourage your team to identify problems, ask questions, and get help. Small peer groups of people working in similar communities is also a good idea. Mentoring and support. This covers both informal mentoring and professional options. This is best for business skills, strategy, and some technical expertise. Experimenting. Especially in technical (use a sandbox!) and some areas of engagement. You can run small trials to see what does or doesn’t work. This is a process that never ends. The goal is to set benchmarks, track progress, and push for ongoing, non-stop, improvement from every member of the community team. Set a skills roadmap for every person you work with and compel both of you to review it every 3 months.